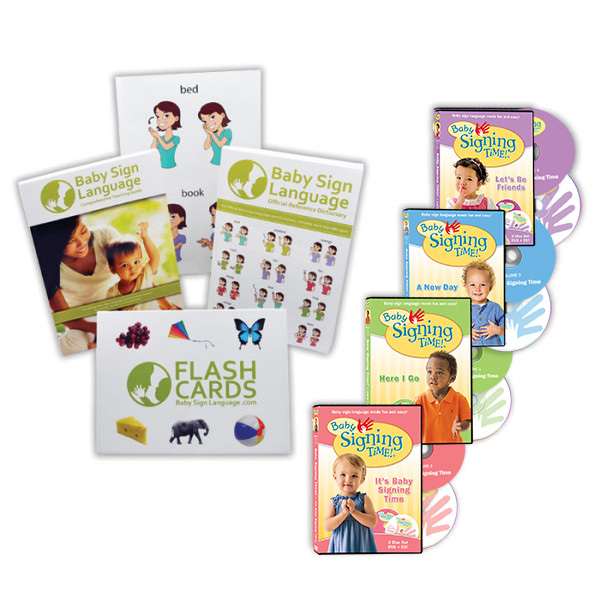 The Ultra Baby Sign Language Kit is our most complete collection of Baby Sign Language Resources bundled together and discounted more than 40%. The kit includes: (1) Baby Signing Time! DVDs; (2) Baby Signing Time! 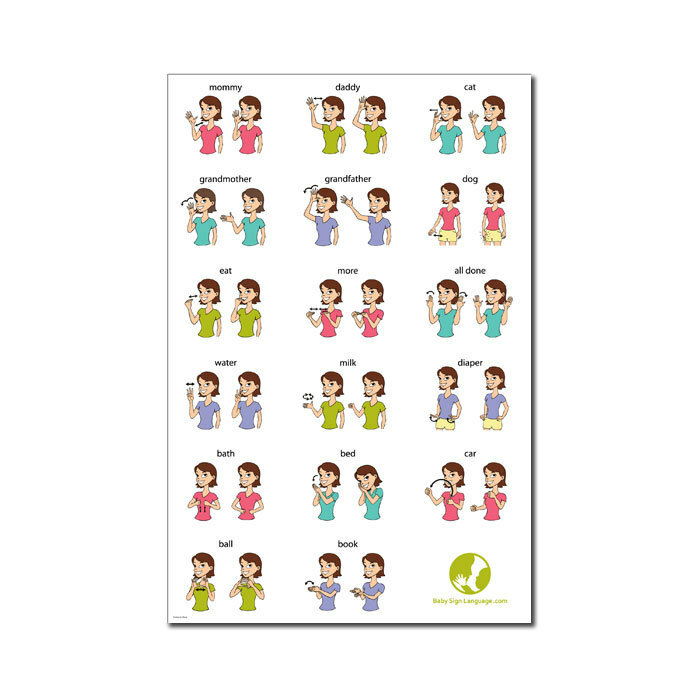 Language Books; (3) Baby Sign Language Guide Book; (4) Baby Sign Language Dictionary: (5) Baby Sign Language Flash Cards; and (6) Baby Sign Language Wall Chart. The Baby Signing Time! Board Books combine all the benefits of reading and signing. While your baby enjoys hearing the delightful adventures of Leah, Alex, and Hopkins (the frog) she is also expanding her signing vocabulary. 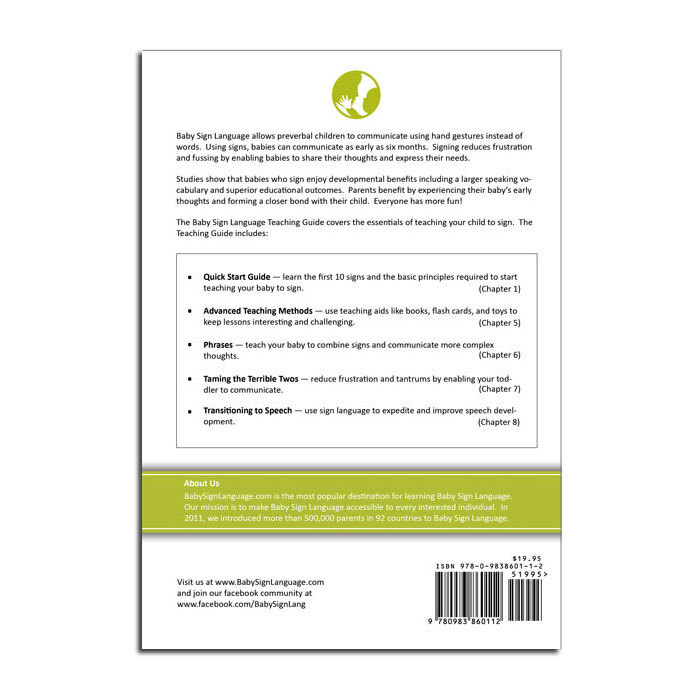 Each book covers a theme including: foods, bed time, outdoors, and friends. 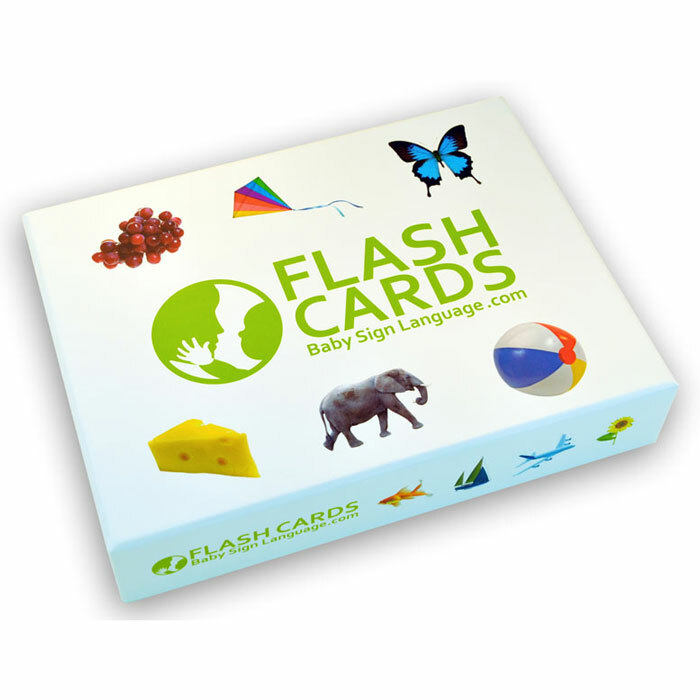 The flash cards allow you to greatly expand your signing vocabulary with categories such as people, animal names, foods, and everyday objects. The front of each flash card shows the word and image for the child. The back of the flash card shows how the sign is performed, a handy reminder for the adult. AWESOME! Baby Sign Language has changed our lives and the raising of our children! We have loved our experience with Baby Signing Time. I liked all of the extras in the Ultra kit, and we get daily use out of the flash cards, DVDs, board books, and dictionary. We have 22 month old twins who have been signing since they were 6 months old. We signed a few starter words from the time they were born, and around 6 months old started the first DVD in the background while they played, quickly moving on to the second and third DVDs before they were 1. The 4th one is the current favorite, but some signs require more dexterity than they had in the beginning. They now can sign well over 200 words, beyond what is in the DVDs and books. They love playing with the flashcards and finding their favorite words and pictures, and it’s a challenge to keep up with them with their expanding vocabulary. Their verbal vocabulary is even larger, and they love to use any new words and signs we learn to talk about the world around us. 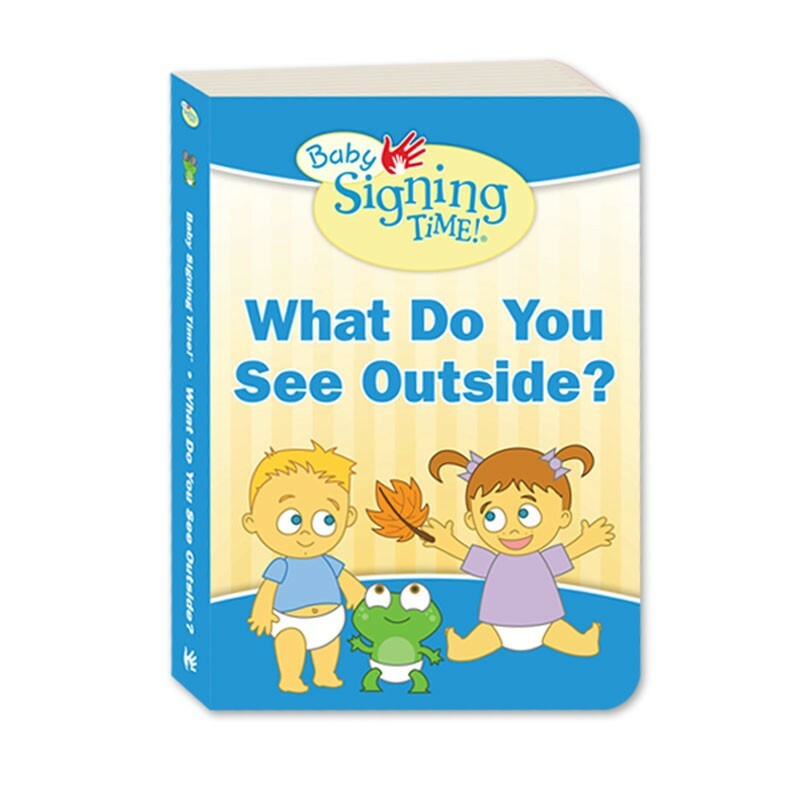 We have to teach ourselves new words for all of our activities – they love to sign all of the zoo and aquarium animals, and other things we see while out and about. I firmly believe that being able to sign early has been amazing for communication skills and helping prevent meltdowns, since they are able to tell us what they want or need. When they start to apply their knowledge and tell you how they are happy, or tell you about the weather when they look outside is just amazing. 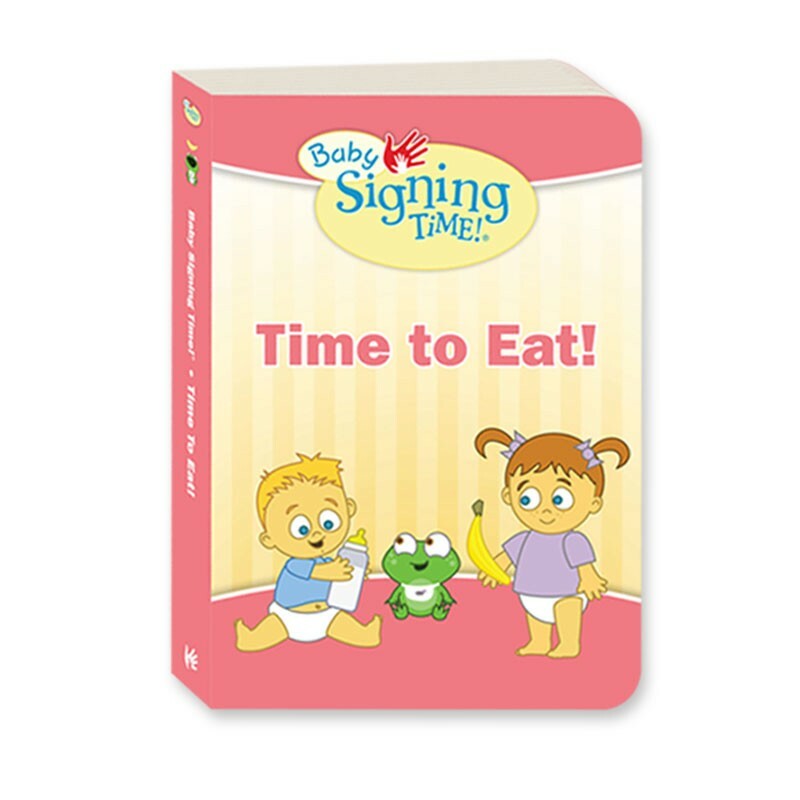 I recommend the Baby Signing Time products to all of my friends and family that have or are having kids. Our family has picked up some of the words as well. They don’t have a choice – our daughter’s favorite game is to quiz everyone on all of the signs she can do! I’m looking forward to continuing with signing as they get older, and will definitely use signing if we have any more children. A larger dictionary (or being able to print/download the online one more than one word at a time) and more flashcards would be great! Let’s start off by saying this program worked out amazingly for my family and I. It has been an awesome journey to watch my kids learn and interact sooner then they would have, had we waited for them to talk. We have had less fits and break downs with more interaction then I thought would happen or be possible. We had started with my daughter at about six months old and after how well it went we continued using it after my son was born. They are three and two now and still learning each day. We have moved on to more advanced signing with the signing time series and we watch at least one episode a night. To watch them get something new or start using something they picked up in passing is a fantastic event and wonderful feeling. I also have used it my self to start learning ASL for my job (fire fighter) so I can communicate with patients I may come across. I give this product five stars. You are not only connecting with your children sooner but teaching them a second language! I tell every one about my experience and try to get them to try it in hopes they will have as much fun as we did and are. Looks like there are a ton of positive reviews so I’ll try to keep it short. “N” loves it. We let her use each item at her own pace but started with the videos and flash cards early. At 12 months old she had close to 100 words and daycare said her language and communication were at the 3 year old level. She’ll be 2 in a little more than a month and she certainly has over a thousand words. Seeing her ask for what she wanted for breakfast every morning when she was 8-9 months old, discovering that she could actually communicate with us for the first time around 6-7 months when she figured out the bear on her wall and the book and the teddy bear were all “bear”! OMG. Ok, I’m a guy and thinking back to that moment makes my eyes tear up. Nothing better to give a new parent than this. My granddaughter couldn’t get enough of these videos! She is now 2 years old and talks up a storm! I started watching the videos when my baby was 7 months old and once I learned some signs, I practiced them with her throughout the day. By 8 months she was signing. She’s is currently 2 and still uses some sign even though she speaks very well, which I attribute to signing as a baby. We loved the materials and the signing not only helped her language development, but kept tantrums and frustrations to a minimum since she was able to communicate some needs to us. Now that she is talking in sentences, I wish there was a signing aid I could use to help her sign in fuller sentences that would also be age appropriate. My kids are picking it up little by little We find ourselves signing words to other people and realizing they don’t know it! We had such a fun and easy early childhood thanks to Baby Sign Language. We skipped the fussy tantrum stage because he could sign ‘help’ when he wanted a toy or couldn’t open something or was having difficulty. He ate well because it could say ‘food’, ‘more’, ‘milk’, ‘water’ and ‘finished’. Through games, like peepo, we taught him the sign and concept of ‘scared’. We were surprised when he said he was scared of the newly mowed grass at the park, or the big Italian waiter statue at a restaurant. Without signing he would have just fussed at these incidents and we would have wondered if he needed a drink or a nappy change. He could sign when using his nappy which made toilet training a breeze. At 2 years old he was taught to use the toilet in just one day because we could easily communicate with each other. I started using the free online baby sign language dictionary, just learning a sign here and there: The short videos are excellent. Then we bought two of the premium packs for our community to use through our toy library. We started watching the DVDs and learnt even more signs. We love the songs and still start every day with, ‘it’s a new day, da doo day”. 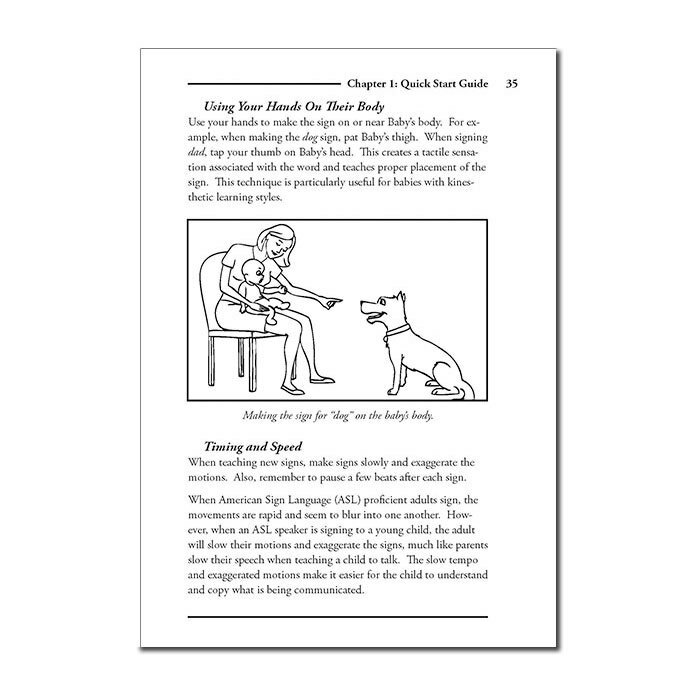 Friends often ask, will signing slow down your baby learning to talk? Absolutely not, quite the opposite. Signing babies can already ‘talk’ (with signs) and are used to having ‘conversations’. Once they can make the right sounds the words will quickly replace the signs because it requires much less energy to say something than sign it. Even though my son is now 3 and talking fluently we are still using our signs: In the playground, when he’s far from me, I can sign ‘one more minute of play’ and ‘come’ or ‘do you need the toilet?’. We took a flight the other day and my husband was signing to us, ‘where’s baby dog?’ and ‘want water?’ because we couldn’t hear with our ear plugs in; and in the mornings I can sign, ‘shh, Dad’s sleeping’. You’ll notice, we do the signing now! 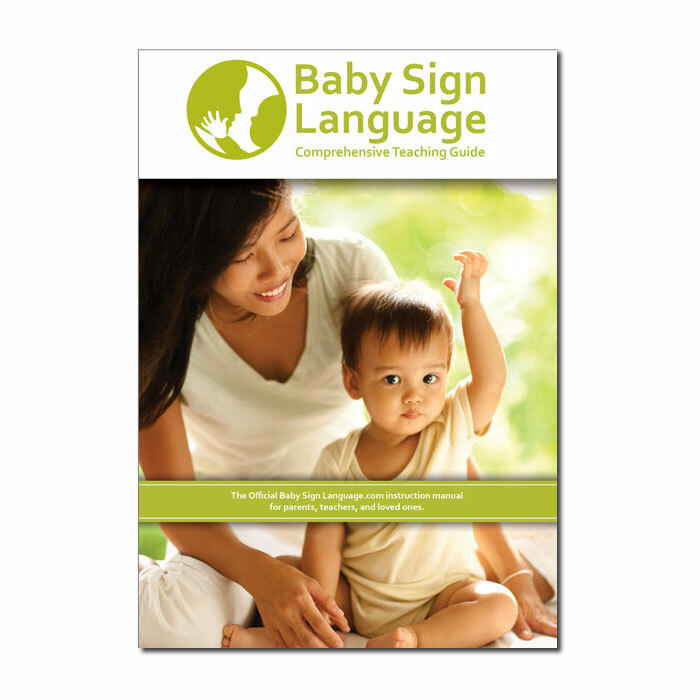 I recommend Baby Sign Language to all my friends and I encourage you to give it a try as well. The first time you truly communicate with your baby will blow your mind! 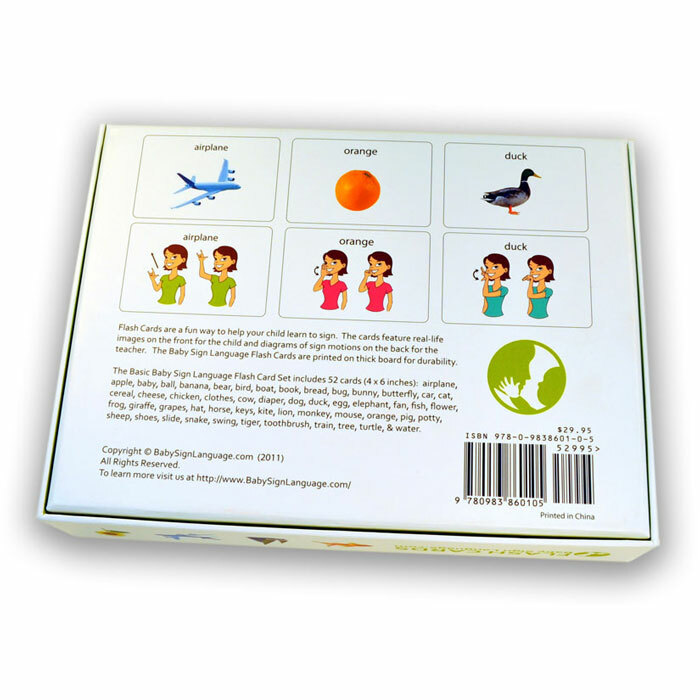 We absolutely love our Baby Sign Language kit. We started signing when my son was about 9 months and he picked it up so quickly. Now, at 21 months, he knows just as many signs as he does words and whenever he asks what something is, he wants to learn the word AND the sign. We fully intend on continuing with sign language as a second language for him and we couldn’t have done it without Baby Signing Time! I absolutely love Baby Signing Time with Rachel. She captivates my daughter with her lively songs as well as makes it easy for me to learn. My daughtet is 19 months old and I introduced baby sign language to her at about 6 months and she knows so many words. She understands me and responds and I understand her. I feel this has saved us both from the frustration of poor communication. I can’t wait to get her the pre-school dvds to put her further ahead of her age group. We love the baby sign program. I even have all the apps. My son who is now two and has shown to be more advanced than other children in his class because the program taught him words to communicate, songs to sing and sign language. I love the program and I’m looking forward to continuing the program with my daughter when she is born too. bought several of the Baby Sign Language materials for my newborn granddaughter and it opened up a new world of communication for us. She learned many different signs and I could tell that she gained confidence by being able to participate in our communication. The baby classes she attended used baby sign language extensively so my granddaughter was able to feel ahead of the game and not left out. I feel that this gaining of confidence and not feeling left out is an important benefit of using Baby Sign Language and is one that I didn’t anticipate at the beginning when I was focused purely on communication. I have always been interested in sign language and am grateful for the beginner’s entree that this program gave me. We started signing with our grandson around 1 yr old. It helps him to communicate with us, have less frustration & gain confidence! He is turning 3 soon & can sign every sign taught in all four videos!! The poster was a great visual for words used constantly. The cards help to expand his communication tremendously. Thank you for such a great product & making a difference in communication for him. 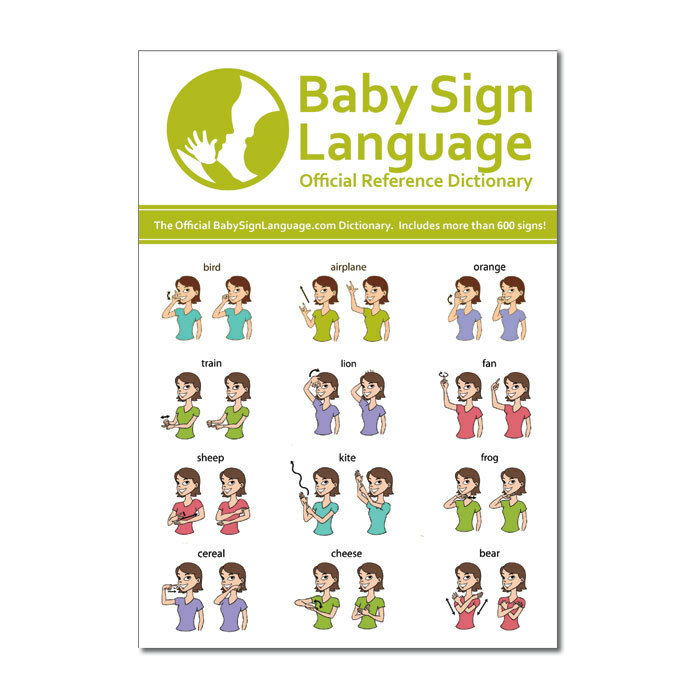 I purchased the Baby Sign Language Ultra Kit. I love it! I think my baby enjoys watching the babies in the videos. I think it is very helpful showing other kids/babies in the video signing their own way. We have been using the Ultra Baby Sign Language Kit since my Angelo was born. We started showing him basic signs from the moment he was born and signed his first sign which was milk at six months old. Angelo is now 13 months old and can sign 60+ signs. A day does not go by when we don’t sign with Gemma , 2 boys and 2 more girls. In the cars between field trips, in our rest time when all kids can not sycronize their nap , is just a deserve it breack. And further more , I LOVE IT. I found my self instead of educated my self how to teach , I end in glaze at it, and look like a child absorbed by it . My husband will always laugh how deep I find my self watching it. For us the shipping cost is a pain; the shipping is equal with the price kit , I wish it can be something in there to make it a notch better. OVERALL, IS MORE THEN WORTH IT . I will buy it with eyes closed, I recommend it to all my clients, home schools mom and young moms , and it is worth it to save money for one year and buy it for Christmas. We are a big family that comes with small pockets , and I will not change a thing , but yet no matter who are income goes and comes , is our greatest gift to have it . Last thing, my friend from China came to visit , T Cheung and I order for me two kits ( one to have it as hard copy and other to use it in home school ) and she took both kits with her to china to help teach preschool to K kids . I receive thanks letter and make me cry to see your powerful way of teaching. Take care and good luck . When I will save more money I will by the preschool kit and grade 3 , hopefully the new future will add up in the kit. I normally don’t review products but I wanted to share my testimony mainly because I am so proud of my baby Simon. We are a multi-ethnic family (My husband is polish) and speak both English and Polish at home. We are trying to raise a multilingual child to give him an advantage in a global economy when he becomes an adult. We decided to go for the really big kit mainly because we felt we were going to use it for years to come. Our hope is to have two more babies. I mainly work from the dictionary which I keep in my diaper bag and use it as reference even when we are out as Simon begins to notice stuff around. We are very hands on in the way we learn. To help Simon make connections we printed matching cards from the website and play scavenger hunts by giving him the flash card deck and having him find the objects with the card glued to it. Simon is learning really fast. Sometimes he learns two signs per day. My only complaint is that the dictionary is black and white instead of color. We love Baby Sign Language! I started using it with my son when he was 5 months old. Even though he wasn’t signing, I kept using it consistently. When he first signed back to me, I was floored! He is three now and has been diagnosed with autism and speech delay. Signing has open our communication! He has the poster in his room and he loves playing with the flash cards. Not only do they teach him signs, but now that he’s more verbal, they work as a speaking aid! I highly recommend Baby Sign Language for all kids. It’s fun and you’ll be amazed to see you child communicating with you non-verbally. We loved the kit! Our son absolutely loved the flash cards, and they’re still a big favourite. I took sign language for three years in high school, needless to say my skills had grown a bit rusty. 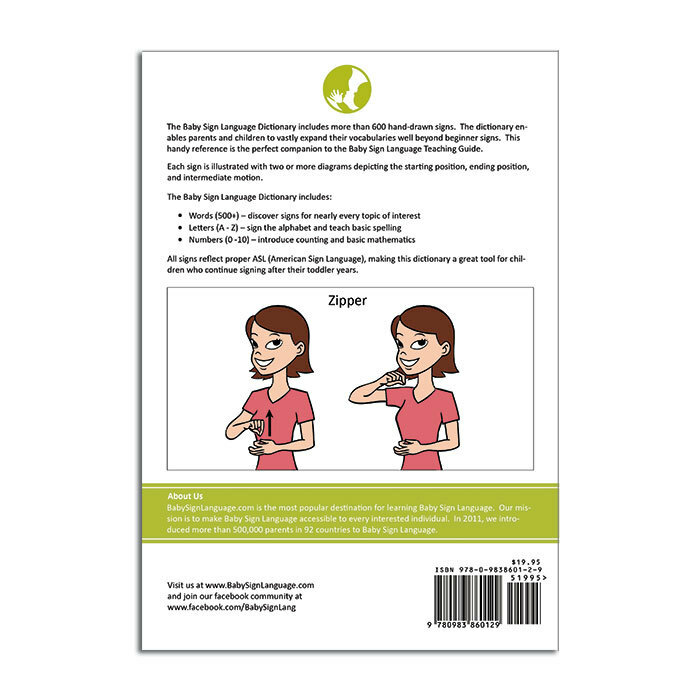 I had always envisioned teaching my baby sign language so as soon as I was given the news about my pregnancy my search began for a baby sign language book. 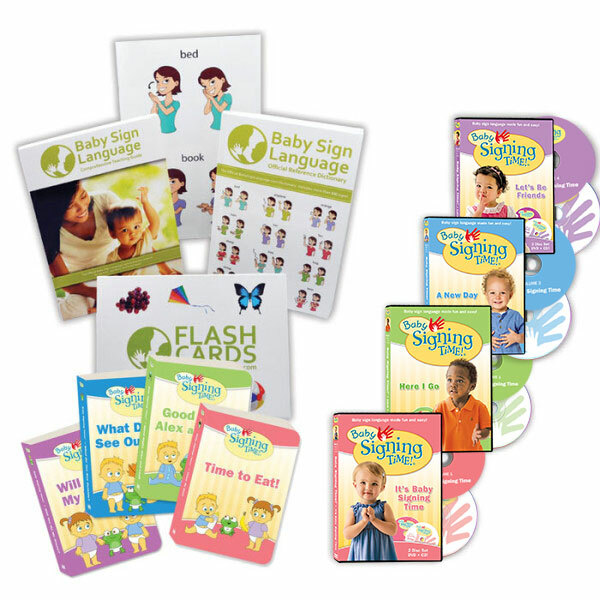 I came across Baby Sign Language and was so excited about the kit they offered. The kit arrived without delay and it was packaged with care. The kit blew me away! I immediately hung the poster that demonstrated the basic words for baby. I opened the flash cards and categorized them based on frequency of use. I also flipped through the pages of the extensive book of signs. I love every piece of the kit and I couldn’t ask for anything more clearly organized and well constructed. My baby is nearly five months old and she is already recognizing signs including milk, mommy, daddy, diaper, bath and a couple others. The only thing I wish it had is a set of the alphabet in some form whether be poster, flash cards or something else. Wow! I can’t say enough good things about baby sign language. When our daughter, a very high needs baby, was 3 months old I told my husband we had to do something. I couldn’t wait for her to become a talking toddler, that we needed to know her needs sooner. That’s when I decided that sign language was probably for us. We started at 6 months with our 5 signs. By 7 months she was signing milk and at 8½ she was signing for food. It was a God send to know what my baby was wanting. It’s only grown from there. She will be 2 in a couple weeks and she knows 20 signs. One thing I noticed over the last year is that my child might not say as much as others but she communicates better than her peers. The Baby Sign Language kit was great and certainly gave our daughter a head start on communicating. She quickly learned basic signs and was able to let us know what she wanted and when well before she began talking. Even better, our daughter began talking well before her peers and continues to be ahead of children much older than her in her vocabulary and sentence structure. As baby sign language was recommended to us by people who experienced similar results, I have to think the baby sign language program was a key contributor. 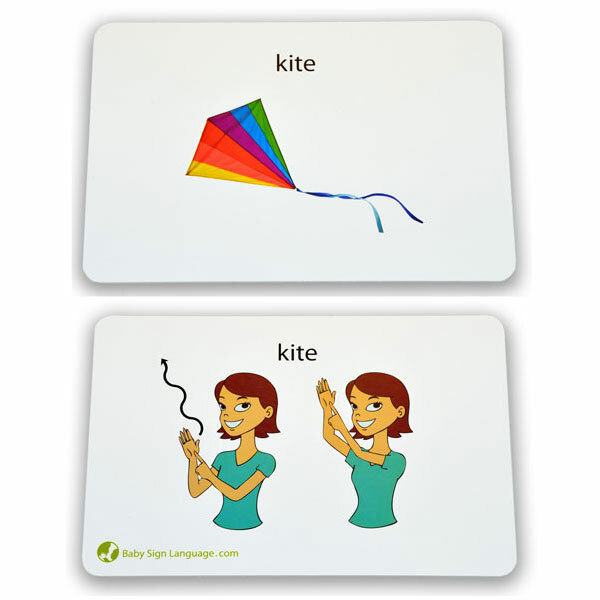 The cards are great, and while some have some teeth marks on them at this point, we still use them for both the sign language and vocabulary building. We are getting ready to start using them with our second daughter and have already started integrating basic signs with her. 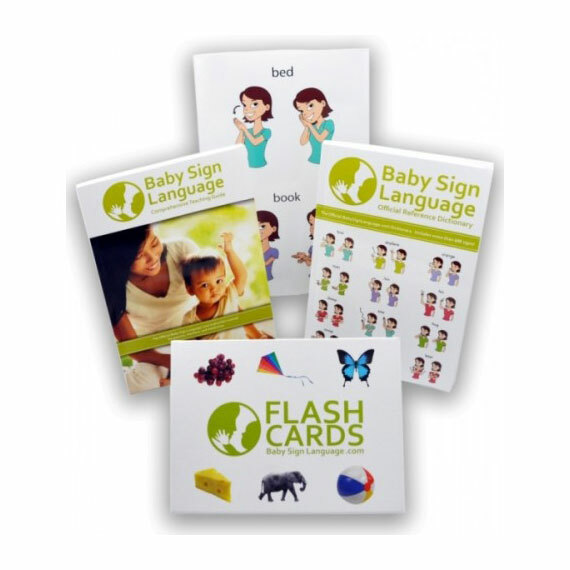 So much of children’s frustration and tantrums stem from their inability to communicate, the baby sign language kit truly gives them tools and building blocks to (while maybe not totally avoid) lessen those terrible twos. I will also note that for the reasonable price it makes a great gift; while clothes or toys are great, giving a family something that will truly change the way they interact and how the child develops is so much more meaningful and special. These are our favourite DVDs for signing, and the dictionary is a great quick reference. My daughter loves watching the babies sign and learned quickly from the DVDs. It was also very helpful for me to learn along with her. I upgraded to this kit so we could have the books as well, and that was a great decision. My daughter loves the books and knows that they are the same characters from Baby Signing Time. Those were the only books she was interested in for awhile. Since using sign language to read them she started using her signs with other books, pointing out all the animals, plants, and food. This is amazing to watch and experience. I received the Baby Sign Language Ultra Kit in December as a Christmas gift from my parents for my daughter Ella. I could not believe my eyes when I saw all the stuff that came in my kit. Literally I had enough material to teach Ella hundreds of signs from basic stuff you see at the playground to more complex signs that match her personal interests. Ella is a very smart little girl and she is reward-driven. The Teaching Guide came with tips that made sense to us in terms of rewarding Ella without letting her have her way in things that did not make sense (In our case it relates to chocolate. Ella loves chocolate and she would sign and ask nonstop) The Guide showed us how to acknowledge Ella, make her feel like she was understood but decline her request. Ella is 16 months old and can now sign over 60 signs. She loves her baby sign language Flash Cards and we spend a ton of time reading and re reading the Baby Signing Time Board Books. From all the toys and educational materials we have purchased for Ella the Baby Sign Language Ultra Kit is the one we use most. A day does not go by when we don’t sign with Ella.